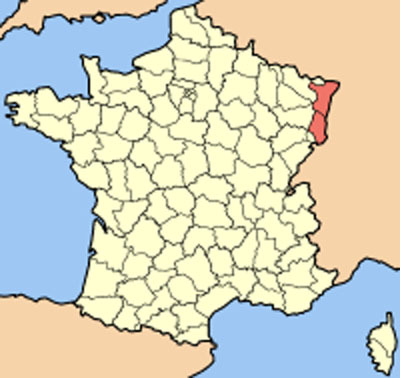 In red, this Alsace map below depicts the Alsace region of France. Alsace borders Germany to the east and is influenced culturally by Germany. Over the centuries it has been a part of Germany and then France, and passed back and forth. Alsace is famous for it’s food and wine. The Alsace wine region is known for producing fruity white wines and is a beautiful area to visit. The Alsace Route des Vins (Alsace wine road) is a famous road from Marleheim in the north to Thann in the south and runs through the wine region. A good place to stay to explore the wine route is Colmar or nearby. 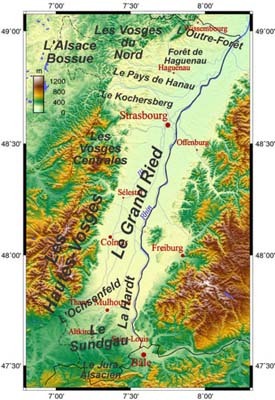 (see map of Alsace below) It’s at the midpoint of the Alsace wine road. You can spend 1 to 3 days exploring this area. Colmar is beautiful historic town and a popular art center. Ibis Colmar Centre Recommended by Rick Steves and highly rated by visitors as a good moderately priced hotel. While I've never stayed at this one Ibis hotels are good value for the price. Novotel Colmar Highly rated by visitors. Maison Martin Jund Relaxed budget friendly. Owned by a family who are winemakers. Well reviewed by visitors and a favorite of Rick Steves. Near Colmar, is the smaller beautiful village of Eguisheim, birthplace to wine growing in the region and also a great place to stay to explore the wine route. Create your own Alsace Lorraine culture adventure like our contributor John, and wander off the Alsace wine road. Armed with a good map it's easy. Get yourself a good road map like this one: France, Alsace Lorraine to take on your trip. The geography of France in the Alsace region of France has the the Vosges mountains as the natural border to the west (Lorraine is just the other side of the Vosges) where you can drive up to the top. Or closer and easier, the forests provide nice hikes, picnic opportunities, and camping. The Rhine River is the natural border with Germany to the east. A great region to visit and enjoy outdoor activities as the weather is dry and warm due to the river and the mountains which act as a barrier. Trains can take you to Strasbourg and up and down the wine route. If you’ll be driving to and around Alsace you'll appreciate these tips on driving in France . Airports in France closest to Alsace. If you’ll be camping:A camping in France guide. Want to rent a cottage or villa? Important things you’ll want to know first. 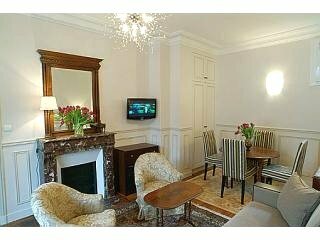 Self Catering France guide to rules and regulations. Eating: France food menu guide while eating out.